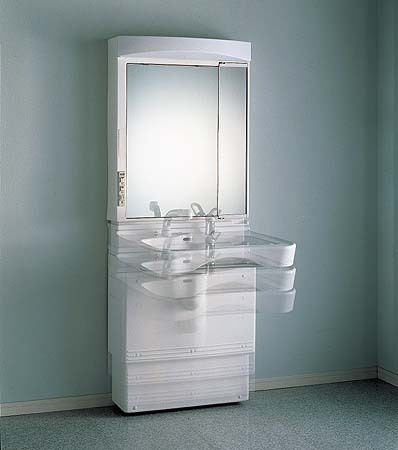 movable counter top for kitchen, washstand, and many other products for wheelchair users. Mechanism of horizontally moving large object requires much skill and cost, still, as for the vertical likewise elevator in station, there are many merits unreplaced by any other ways. It is the demand of the society. Sanyo Electric's endeavor to solve this difficult issue resulted in development of specific products and unique ideas. This beautiful product is suitable for hair dressing and convenient for children due to the movable washbowl, and also the space underneath is large enough for wheelchair to fit.